Included below are The Village at Mammoth condos for sale updated daily from the Mammoth Lakes MLS. The White Mountain Lodge condos, which face Mammoth Mountain, can offer beautiful views, especially from the higher floors. Some of the White Mountain Lodge condos can be noisy depending on the location (above the bar). Lincoln House condos was the second building to be completed at the Village of Mammoth. This location tends to be quieter than White Mountain Lodge. The Lincoln House condos, which face north, offer a great setting overlooking the reflection pond, fire pit and Grand Sierra Lodge swimming pool (which is for the use of all three buildings). The south-facing condos at Lincoln House offer views of the Sherwins and stay much warmer in the winter months. The Grand Sierra Lodge condos building was the last of the three buildings to be constructed. This building is where the central check-in is located for the Village at Mammoth. Many people enjoy staying at Grand Sierra Lodge because it offers the best amenities out of the three buildings (larger fitness room, directly adjacent to year-round swimming pool, etc. ), and is considered "the center of the Village at Mammoth". For rental purposes, the Grand Sierra Lodge condos have historically generated the highest rental income averages. 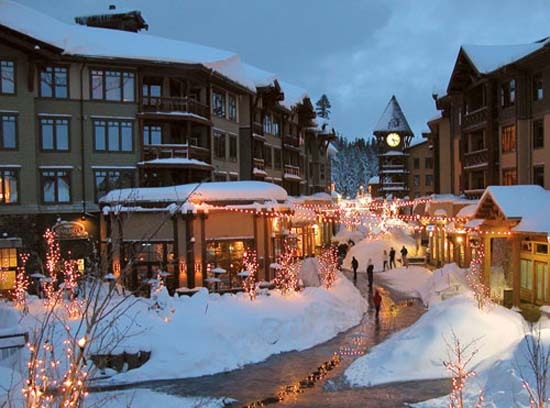 Many people enjoy the conveniences of having shopping, dining and direct access to the Village Gondola to Canyon Lodge, which the Village at Mammoth offers. There are also quite a few condos that are located close to or adjacent to the Village at Mammoth. Some other condo complexes that are nearby are: Helios condos, Grayfox condos, The Westin Monache and many more. If you would like more information on any of these condos for sale in The Village at Mammoth, just click the "Request More Information" button when viewing the details of a property. We can provide you with disclosures, past sales history, dates and prices of and condos recently sold nearby, and more.